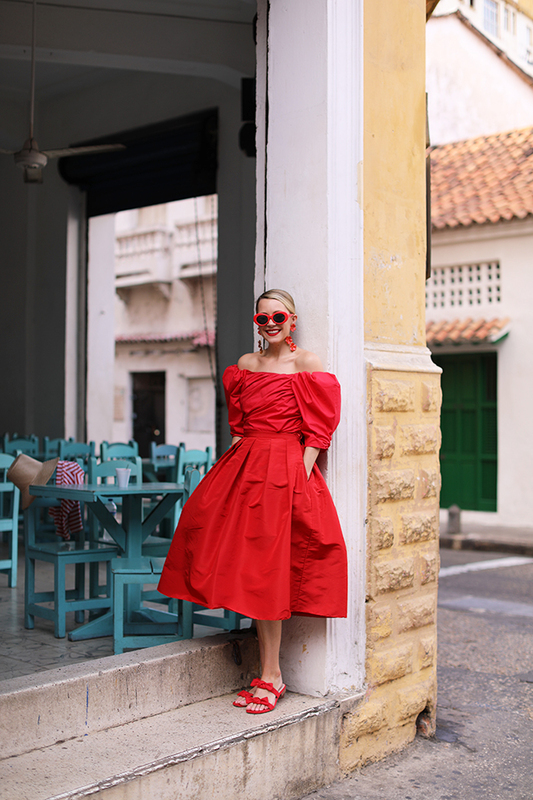 All about red today on A-P! This week is all about my favorite colors for spring. 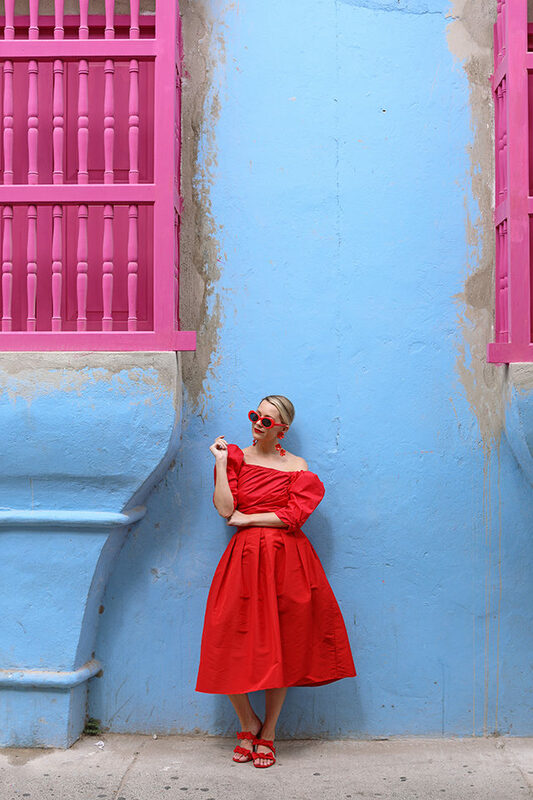 I don’t shy away from color and red has been a long time favorite of mine, so no surprise I am starting the week with this vibrant hue. 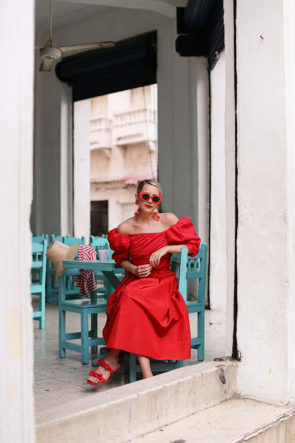 You can shop ALL my favorite red pieces for spring over here on Edit & Etc. PS if you missed my favorite accessories for spring you can see the wrap up right here. Top: Petersyn (also so good with denim!). Sunglasses: Sold out, very similar here! Earrings: Jennifer Behr (PS see all my favorite earrings for spring here). 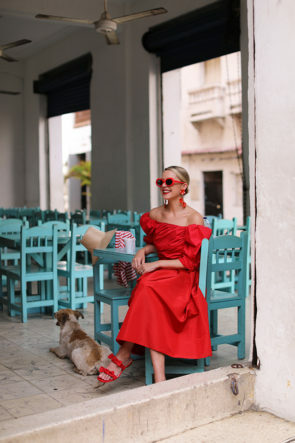 Shoes: HM, old but I am head over heels for these red bow raffia shoes. Skirt: Oldie but goodie from Tibi – they still sell it in black here. Hat: Bought in Cartagena. Stripe top: Jcrew. Your red dress is absolutely wonderful! Great post! You always take the cutest pictures with the most gorgeous backgrounds. Red is truly a beautiful color on you. This is perfect! I love the entire outfit! I love the stunning bright red color of the dress! 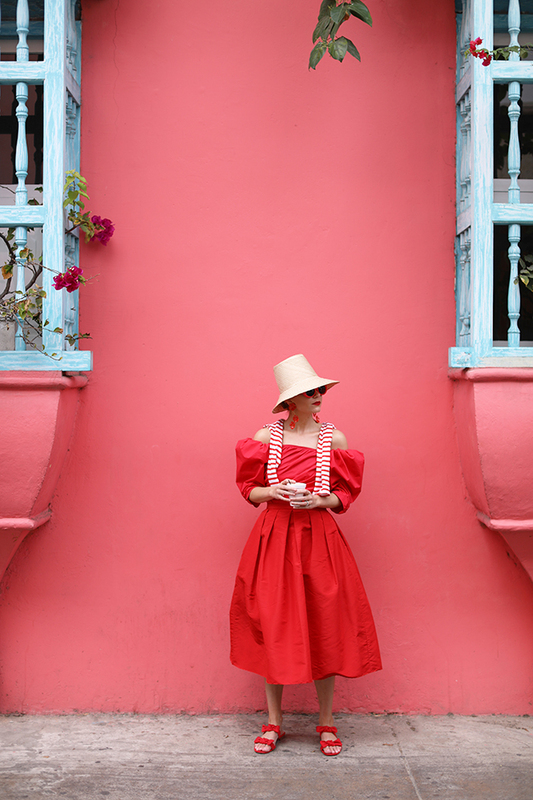 This is the most incredible total red outfit ever! You are looking impressive ! you look absolutely gorgeous in that red dress! Obsessed with the dramatic red! Very pretty dress but that hat is fantastic. It was a common style in the 1960’s. It makes the outfit look modern retro. Just fabulous! It’s a good thing you don’t shy away from color, seeing as it definitely suits you! You look truly beautiful in all these shots. This is such a beautiful dress! I just love the backdrops you choose! that look is just so fun! This is why red will always be my favorite color. This ensemble is amazing. I love your dress the sleeves are amazing! omg this dress is amazing!! Much love for this look!!!!! You look great! 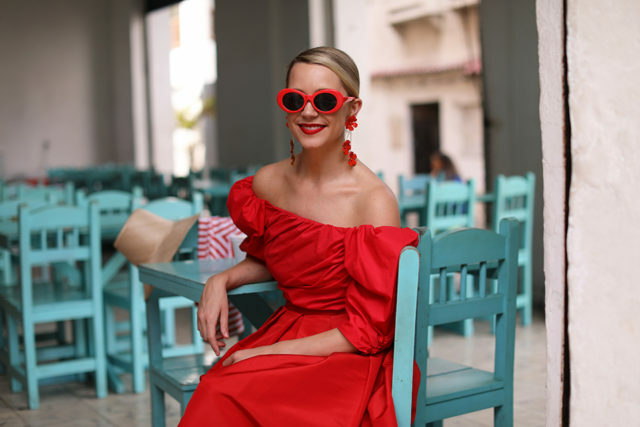 Amazing red dress!!! This is so beautiful! Only you can pull it off! the best in your outfits and backgrounds as always!!!! Oh my gosh I’m in LOVE with your photos! 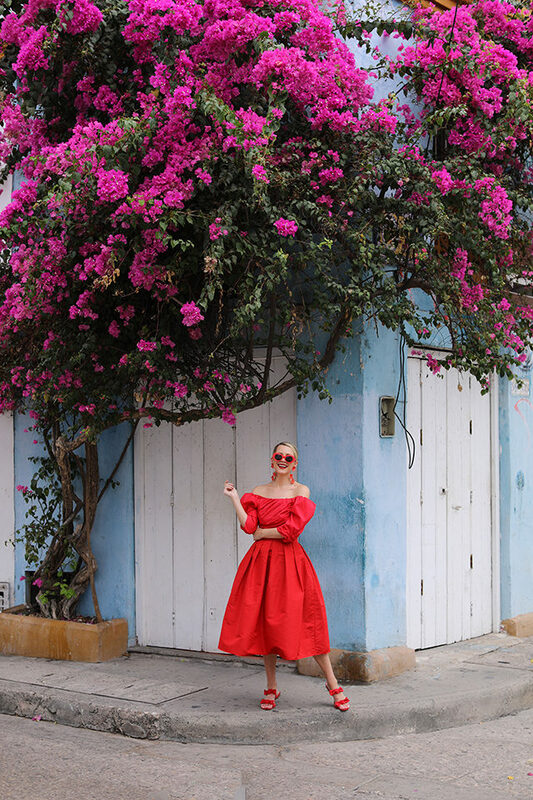 The dress is amazing, but against that blue wall with the magenta bougainvillea overhead? I Die. I am a huge fan of red . What I really love here is the Petersyn top . The movement across the front is an exceptional work of construction. You look beautiful darling. My family and I have a vacation home in Cartagena, I know exactly where you are standing in your photos! It really is one of the best vacation spots! Have fun! All your outfits are to kill for. the perfect way to pull off the one color look. love the sunnies!